The leader of Cambodia’s main opposition party, Kem Sokha, was released on bail on Monday, a government spokesman said, a year after he was jailed on treason charges. The Water Resources Ministry yesterday warned that seven provinces will face floods again this week. In June 2018, a leaked environmental impact assessment report on the proposed Sambor Hydropower Dam project in Cambodia revealed that constructing a dam at the proposed site could “literally kill the [Mekong] river”. In August 2014, China Wind Global Investment Group Co., Ltd. officially landed in Cambodia and opened another new voyage of its “Belt and Road”. The dog meat trade is on the rise in Cambodia with more restaurants serving a growing demand for the controversial food. The Cambodian government is building a global textile industry on the backs of Cambodian women working the sewing machines on the garment factory floor. Chinese developer Tianjin Union Development Group has unveiled plans for yet another project called “Tourism Vacation Town” in Cambodia that will cost $1.2 billion to be built on an area stretching over 1,200 hectares at the country’s southern shoreline. Japanese soccer star Keisuke Honda, recently named general manager of Cambodia’s national team, said Sunday he will concentrate on building up its players for the future. Taking off from the cat cafes already popular in the Cambodian capital, Chea Raty launched his business to change the skin-crawling reputation of lizards and snakes and convince haters that they are misunderstood. Beat Richner, a Swiss paediatric doctor and cellist famous for his work in Cambodia has died at the age of 71 after a serious illness, his foundation said on Sunday. Three farmers were killed by lightning strikes in Pursat provinceís Prangil commune on Saturday while they were working. King Norodom Sihamoni legitimised the Supreme Consultative Council and appointed 30 representatives of 16 political parties as advisors to the government at the request of Prime Minister Hun Sen. 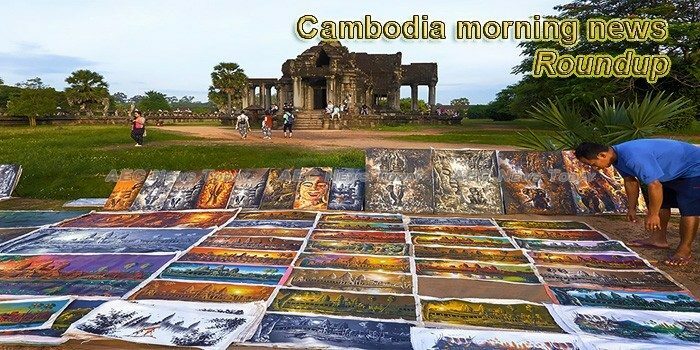 There has been little progress so far in Cambodiaís bid to get three of its most scenic cities recognised by Unesco as world heritage sites, according to high-ranking officials. Macauís leading junket operator Suncity Group, a company listed on the Hong Kong Stock Exchange, has entered into a partnership with locally-registered firm Golden Sun Sky to provide consultancy services in the construction of a resort in Sihanoukville. The Chanthaburi Office for Skills Development recently organized a vocational skills training program for Cambodian workers in Pailin Province. Local firm Confirel has teamed up Le GuÈrandais, a famous salt producer from France, to produce high quality salt for export. Long Beach resident held political prisoner for years in Cambodia safely returns to U.S. When a Cambodian court sentenced her husband, Meach Sovannara, to 20 years in a hellish prison following what human rights observers dismissed as a ìshow trialî in 2015, the Long Beach woman feared she had seen him for the last time. On Saturday, she was happily proved wrong. Yu Ya doesn’t really want to go Thailand. She would much rather stay at home to look after her 1-year-old son. But the Cambodian woman feels like there’s no other option. At least 75,059 Cambodian Grade 12 students passed the National Examination 2018 (Bacc II), an equivalent to 66.% compared to 63.8% in 2017, according to Ministry of Education, Youth, and Sports’ press release on Sunday. Report on Cambodian rice exports released on 3 September indicated that in the first eight months of 2018 from January to August, Cambodia exported more than 341,638 tons of rice to 70 countries, a decrease of 8.9% compared to the same period in 2017, which was 372,190 tons. Prime Minister Hun Sen on Friday defended his choice to keep his whole cabinet unchanged after forming the new government. While African swine fever, a virus that affects pigs has broken out in China and seems to be spreading across the region, the Cambodia Livestock Raisers Association has urged the Ministry of Agriculture to monitor all animals imported from neighbouring countries. General Department of Taxation issued Instruction No. 11946 on 21 August 2018, to clarify the determination of the interest rate between related parties.